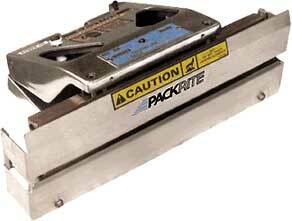 PackRite Thermo-Jaw Sealer with constant heat jaws for sealing cellophanes, foils, mil-spec & laminates. 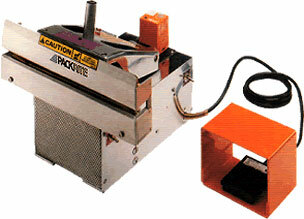 PackRite Thermo Motor-Jaw Sealer with motorized constant heat jaws. The PackRite Thermo-Jaw Sealer is an economical, easy-to-use jaw-type sealer operated by foot-pedal. Heavy duty heating elements and brass sealing bars in the upper and lower jaws provide uniform and sufficient penetration to achieve a high quality, airtight seal. The machine’s adjustable thermostat permits accurate temperature control 200-500°F, further assuring superior seal integrity. The Thermo-Jaw is designed for use on a wide variety of heat-sealable materials, including cellophane, polycel, glassine, laminates, overcap labels, polypropylene, krafts, foils and even MIL Spec materials. The types of sealing impressions are available: flat smooth seal, wide vertical crimp with 16 vertical serrations per inch, and wide horizontal crimp with 12 horizontal serrations on the width. The Thermo-Jaw comes with either 3/4” wide or 1” wide seal bars, just specify which one you need. A 16-digit embossed code dating bar is also available as an option (on 1" wide seal bars only). The PackRite Thermo Motor-Jaw Sealer is a motorized version of the Thermo-Jaw. It is a versatile, motorized heat sealing machine that provides either continuous automatic or intermittent stop/start cycling with the flip of a switch. In the automatic mode, up to 30 packages per minute can be sealed. In the intermittent mode, the machine is controlled by footswitch. The dwell option allows the user to adjust the seal time for the various types of materials. Machines usually ship in 2-3 weeks, FOB: Racine, WI.